These graters are fantastic for grating cinnamon sticks or zesting citrus peels. They also work "grate" shaving chocolate into fine lacy wisps. 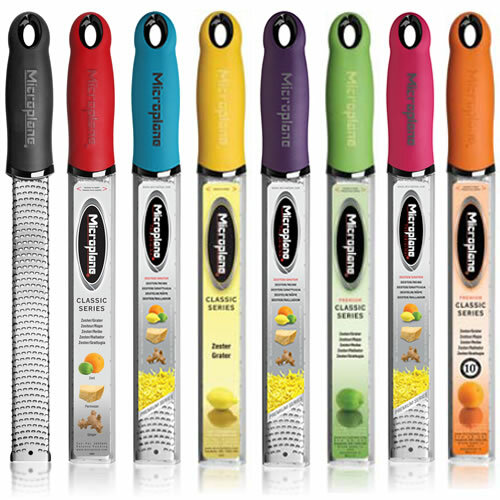 Soft-touch handle available in Black, Red, Turquoise (Blue Green), Eggplant (Dark Purple), Yellow, Green, Fuchsia (Dark Pink)and Orange. Light Pink available but not shown. 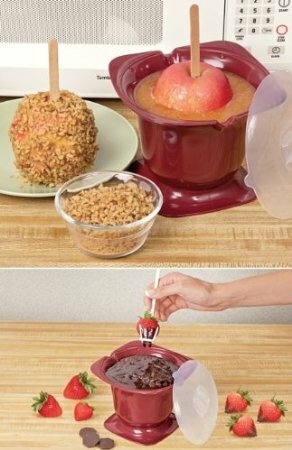 Microwave treat dipper lets you make gourmet-style caramel apples, chocolate fondue and other melt-and-dip favorites at home! Dipping bowl is perfectly sized for easy coating of apples, strawberries, pretzels, marshmallows and more. Just toss in caramels or chocolate, melt in microwave and start dipping! Includes 32 oz. bowl and lid and a 7-1/2" dipping utensil. Use your own chocolates, caramels and sticks or add some of ours to your cart.